Probably occupying the site of a much earlier fortification, Dunvegan Castle was built in the thirteenth century by the MacLeod clan as part of their efforts to secure control of the Isle of Skye. It was substantially rebuilt in the eighteenth and nineteenth centuries creating the structure seen today. Dunvegan is situated within a natural sheltered harbour at the head of Loch Dunvegan, a waterway which gave direct access to the Western Isles. Furthermore its gently sloping foreshore made it ideal for beaching the small vessels used during the medieval period and before. For all these reasons Dunvegan was fortified no later than the early thirteenth century when an enclosure castle was constructed on a rocky summit overlooking the harbour by Leod, founder of the MacLeod clan. 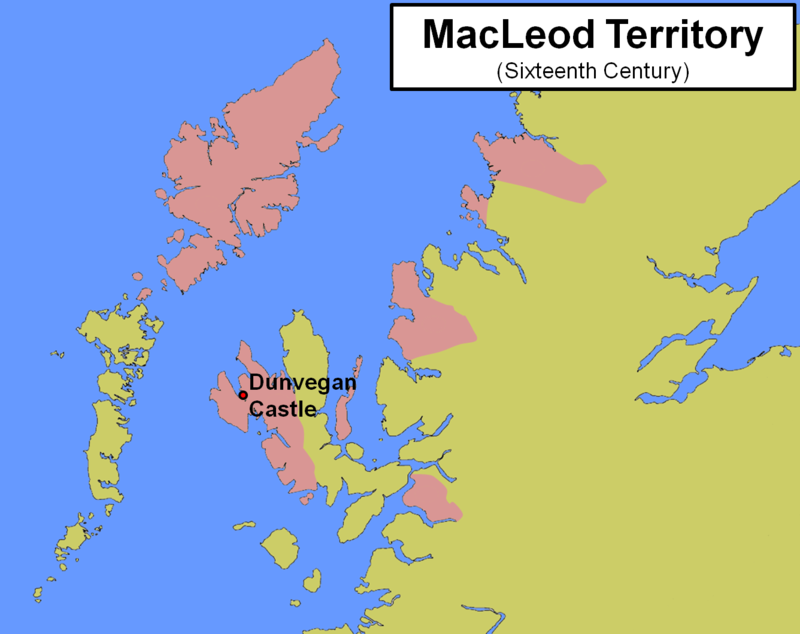 The MacLeods dominated Lewis, in the Western Isles, and Dunvegan was part of their efforts to take control of the Isle of Skye. 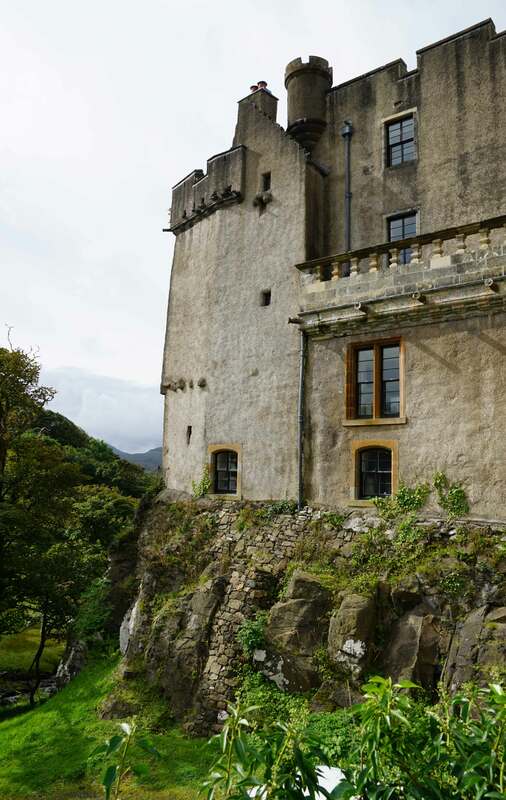 This early castle consisted of a substantial curtain wall wrapped around the summit of the rock on which it was built. Similarly configured castles were raised around the same time at Dunstaffnage, Kisimul (Barra), Mingary and Tioram. At Dunvegan a rock cut ditch severed any direct land access into the fortification. Around 1350 a Keep was built in the north-east corner of the existing curtain wall by Malcolm, third MacLeod clan chief. This four storey structure was intended to act as a status symbol and offer secure, high status accommodation. Dunvegan Castle underwent significant modifications during the sixteenth and seventeenth centuries. The Fairy Tower was added in the south-east corner of the curtain wall around 1500 which enhanced the accommodation facilities. A new range, consisting of state apartments, was constructed in 1623 between the Fairy Tower and the Keep by Ruairidh Mor, the then MacLeod clan chief. A further wing, on the south-west, was constructed between 1684 and 1690 and this seemingly rendered the Keep superfluous for it was abandoned at this time. By the eighteenth century the requirement for the castle to have a defensive function had receded and in 1748 a new entrance was added providing, for the first time since the site was fortified, a land access into the structure. This was followed by a substantial restyling of the castle in a Georgian style in 1790 under the supervision of the architect Walter Boak. The Keep was restored and converted into a drawing room. However, despite the reduction in the castle's defences, a dedicated barrack block was added to the site at this time. 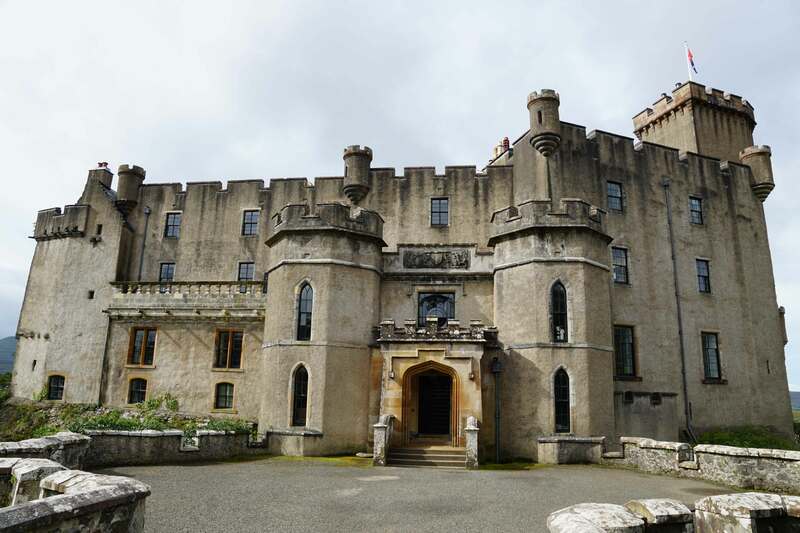 Dunvegan Castle continued to undergo extensive rebuilding during the nineteenth century. The Portico entrance was built by John Norman in 1814. His son, Norman, completely restyled the castle between 1840 and 1850. The design of the new structure was devised by Robert Brown, an Edinburgh based architect, and cost in excess of £8,000. Brown, K.M (2000). Noble Society in Scotland: Wealth, Family and Culture from Reformation to Revolution. Edinburgh University Press, Edinburgh. CANMORE (2016). Dunvegan Castle. Royal Commission on the Ancient and Historical Monuments of Scotland. Coventry, M (2008). Castles of the Clans: the Strongholds and Seats of 750 Scottish Families and Clans. RCAHMS, Musselburgh. Forman, S (1967). Scottish country houses and castles. Glasgow. Lindsay, M (1986). The Castles of Scotland. Constable, Edinburgh. MacGibbon, D and Ross, T (1892). The castellated and domestic architecture of Scotland from the twelfth to the eighteenth centuries. Edinburgh. Macleod, F.T (1913). Notes on the relics preserved in Dunvegan Castle, Skye, and the Heraldry of the Family of MacLeod of MacLeod. Proceedings of the Society of Antiquities Scotland, Vol. 47. Macintyre, J (1938). Castles of Skye. Miers, M (2008). Western Seaboard: An Illustrated Architectural Guide. Rutland Press. Miket, R and Roberts, D.L (1990). The medieval castles of Skye and Lochalsh. Portree. Moncreiffe, I, Pearson, A and Stirling, D (2012). Scotland of Old Clans Map. Harper Collins, Glasgow. Simpson, W.D (1963). 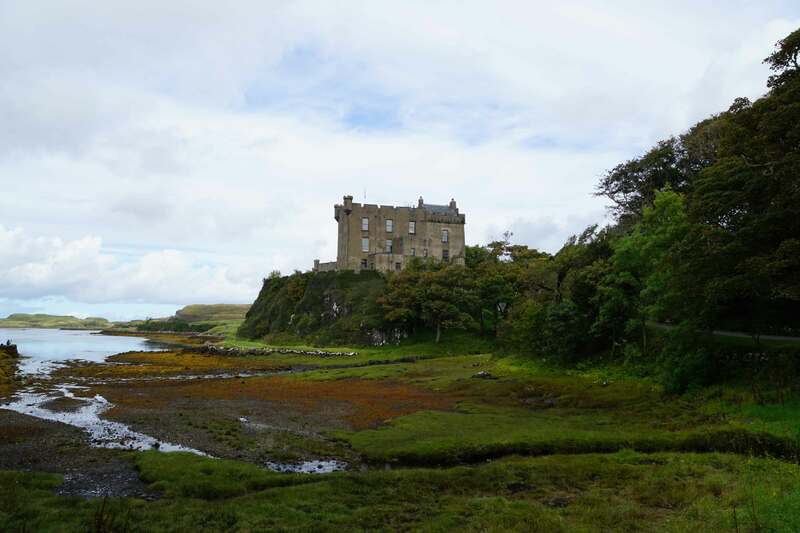 Dunvegan Castle, Isle of Skye: official guide. Aberdeen. Dunvegan Castle was transformed into a stately home by substantial modifications in the eighteenth and nineteenth century. The bulk of what is visible today dates from that period although parts of the earlier fortification do survive. Dunvegan Castle. The castle was built upon a rocky knoll overlooking Loch Dunvegan. This has been mooted as the site of a Dark Age (or earlier) fortification and this is partially supported by the name - Dunvegan is said to derive from the phrase "fort of Began" which implies a tribal caput. Clan MacLeod. The MacLeod clan controlled the Isles of Lewis and Harris, a significant portion of the Isle of Skye and also had mainland territories along the north-west coast of Scotland. 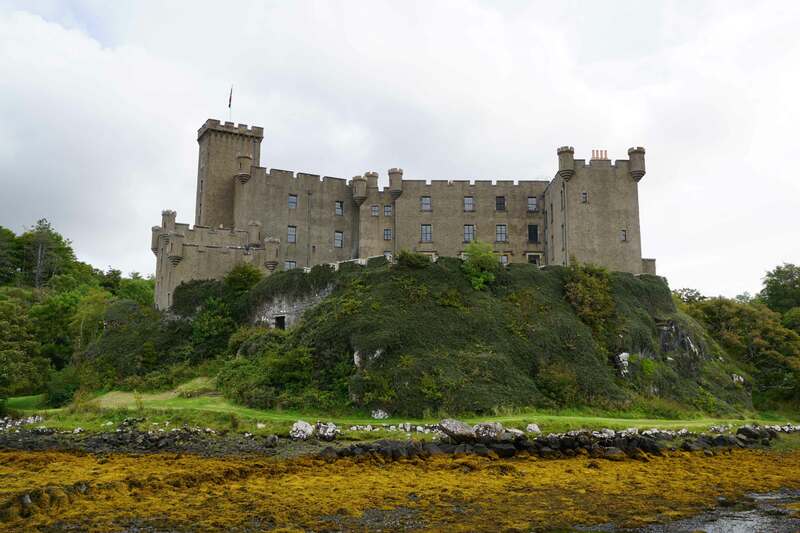 They also purchased the Isle of Raasay in 1518 on which they built Brochel Castle. Fairy Tower. Fairy Tower was added around 1500. Keep. The Keep was added to the north-east corner of the curtain wall around 1350. 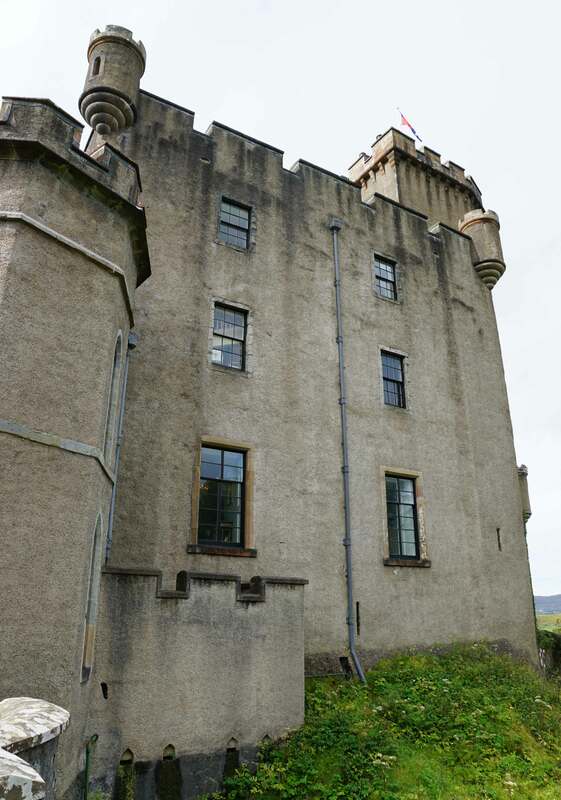 Dunvegan Castle is found off Lochside Road which is accessed at the convergence of the A850 and A863 at Dunvegan. The castle is well sign-posted and there is a dedicated car park.